ST. LOUIS — Andrea Caviedes and her friend, Ximena Gumpel, live in the St. Louis suburbs, have two children and helped plan a Christmas party together, but when it comes to the partial federal shutdown, now finishing its third week, they might as well live in different countries. Ms. Caviedes, 42, a furloughed bilingual loan processor in the Agriculture Department’s rural development program, spent the week visiting her church’s food pantry, applying for unemployment insurance and job hunting at Walmart and Walgreens. After all, the schools are still open, the mail is still being delivered, the trash is still being picked up, the buses are still running and, most important, her family’s income is uninterrupted. The shutdown’s day-to-day impact on Americans — both federal employees and the people who depend on the services they provide — shifts radically from workplace to workplace and neighbor to neighbor. On one side of the divide, the shutdown is inescapable; on the other, it is all but invisible. Some large-scale ordeals, like a recession, are pervasive, quickly gumming up the economy’s gears and seeping into the national psyche. 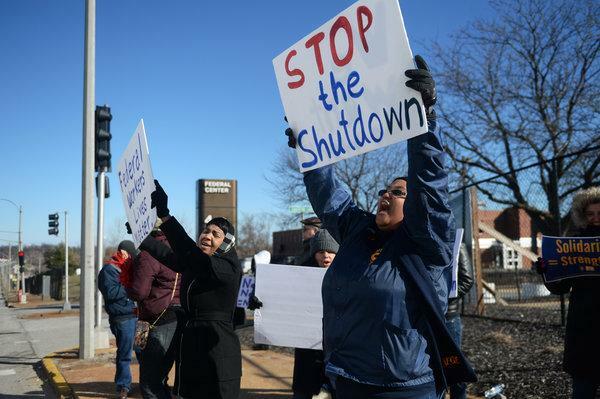 But the fallout from this stoppage is wildly uneven, zigzagging across communities and workplaces in unexpected ways, and fracturing Americans’ reactions to the shutdown as well as the ways they experience it. Some reverberations depend on location. The shutdown touches one quarter of the federal government. The District of Columbia, Maryland and Virginia have large concentrations of federal employees, but about four-fifths of the roughly 800,000 of them who are not being paid live and work outside the capital’s orbit. Thousands are in crowded urban areas in populous states like California, New York, Texas and Florida. Thousands more are in smaller cities and remote areas, where they often power the local economy, spending their paychecks at restaurants, gas stations, nail salons and stores. The scattershot nature of what is funded and what is not is also varying the experience of public-sector workers and private citizens. Agencies including the Pentagon, Veterans Affairs, and Social Security are operating because of appropriations bills that already passed. Others like Homeland Security, Justice, State, Interior, Agriculture, Housing and Urban Development, Environmental Protection, and Commerce are not. So military bases are open, Social Security checks are going out, and G.I. benefits are being processed. But farmers affected by the tariffs are unable to apply for emergency aid; tenants who depend on federal housing subsidies to cover their rent are facing eviction; private contractors working for the federal government are not getting paid, and rural homeowners and businesses who need a mortgage extension or guarantee cannot get one. In Boulder, Colo., where hives of researchers, engineers and scientists are variously funded by universities, private businesses, nonprofit organizations and the federal government, the effects can diverge from one desk to the next. Consider the Cooperative Institute for Research in Environmental Sciences, a partnership between the National Oceanic and Atmospheric Administration and the University of Colorado, Boulder. The staff there falls, in essence, into three camps, explained Waleed Abdalati, the institute’s director. Worst off are people employed directly by the federal government who cannot work and are not getting a paycheck. Then there are those paid by the university whose income is intact but who are locked out of their federal offices and may even be temporarily cut off from their research data. The first days of the stoppage in late December had the discouraging but familiar feel of previous short-term budgetary standoffs between the president and Congress. Many private businesses were also closed or operating with skeleton staffs through the holidays. But as the work world revved back to life after the new year and many federal offices remained dark, the ripples extended further. Twenty-six miles from the Boulder campus is the sprawling Denver Federal Center in Lakewood with 28 agencies spread across 44 buildings. Its low-slung buildings, ringed by wire fence, were abnormally quiet this week. Across the street, at a barbershop called Sports Clips, April Guerrero, 47, said business was way down, because so many people were now on furlough. One of the few customers that day was Lauren Kramer, 33, a furloughed microbiologist for the Food and Drug Administration, who brought her son Wade, 10, for a haircut. After Wade had climbed into the black leather barber chair, Ms. Kramer put her face in her hands, clawing nervously at her chin. She had turned down high-paying jobs in the pharmaceutical industry for what she thought was a “stable” job with the federal government. When she told her best friend, Jessica Rasmussen, 31, about her situation, Ms. Rasmussen was initially unsure what getting “furloughed” even meant. “It hasn’t affected me at all, it makes me feel terrible,” said Ms. Rasmussen, a vocal teacher who is struggling with the thought that as she considers buying her first home, her best friend is worrying about feeding her son. The shutdown — propelled by a dispute between the president and Congress over building a border wall — is splitting the nation, she said. On Thursday evening, Ms. Battle attended a meeting of her college alumni group, whose other members, unaffected by the shutdown, were surprised to learn that she was out of work. “When they come into the knowledge that we’re not being paid, it’s like, ‘Oh my,’” she said. Both he and his older brother, Steve Willenberg — who lives in a nearby suburb with his family — were drawn to work for the government out of a sense of civic duty, nurtured by a mother who is a nurse and a father who worked for General Motors. “We live pretty identical lives,” Rick said. Except that the Department of Veterans Affairs, where Steve works processing benefits, is funded. So while his younger brother protested the furlough outside the federal office complex in wind-whipped weather, Steve was enjoying the last day of his scheduled paid vacation in Carmen del Playa, Mexico, where he swam with dolphins and drank piña coladas by the beach.